Currently upset: I've lost my small camera! I bought the Boots Botanics Soothing Eye Makeup Remover not long ago. Boots is a UK company and I'm a sucker for all things from the UK. 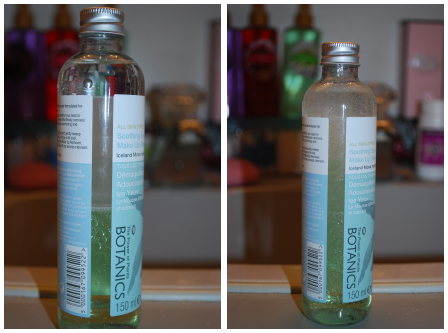 I can find a few things from the Botanics and No7 line here at Shoppers Drug Mart. In the States, I believe you can find them at Target. I think I spent $8 on it, which is a really good price! I almost did not buy this, because I rather like my Urban Decay Clean & Sober. However, I'm really glad I did purchase it because I think it's even better! You don't need a lot of this product per use, just enough to dampen what you use to remove your makeup with. Something with cotton is preferred. A nice alternative to using it at room temperature is to stash it in the refrigerator before use. Now, as opposed to the Urban Decay one that smells absolutely lovely, this one is a bit strange in smell. If I had to describe it, I'd say it smells a bit like watered down bubble solution. Yes, the solution that you used to blow bubbles when you were a kid! It's not overwhelming and you do get used to it. You can see on the left that it is a layered remover with a liquid and oil. On the right is after I have shaken it. To apply it, you first shake it to mix the layers. Put some on a cotton pad (or whatever you may use) and hold it on your eyes for a few seconds. Then, just swipe it down your eye gently and it completely removes your makeup. I have very sensitive skin and I've had no problem with this formula. 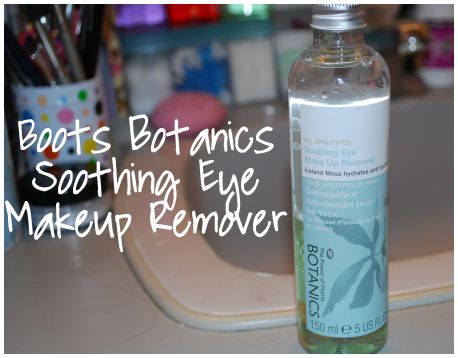 This is the best makeup remover that I have used yet!